What is that Web in my Tree ? Bare limb tips and clusters of webbing in pecan trees are often the first sign that fall is right around the corner. This webbing is caused by clusters of the larvae of the Fall Webworm (Hyphantria cunea (Drury)) which is often also called Pecan Webworm. “Fall Webworm” is a bit of a misnomer in our region since they are able to strike in spring and summer thanks to our long growing season. They are most noticeable in the fall thanks to cumulative effects of earlier feeding. The adult form of the fall webworm is a solid white or white and brown spotted moth that emerges in late March through August in southern climates. After mating they lay orderly clusters of green eggs, usually May through August. 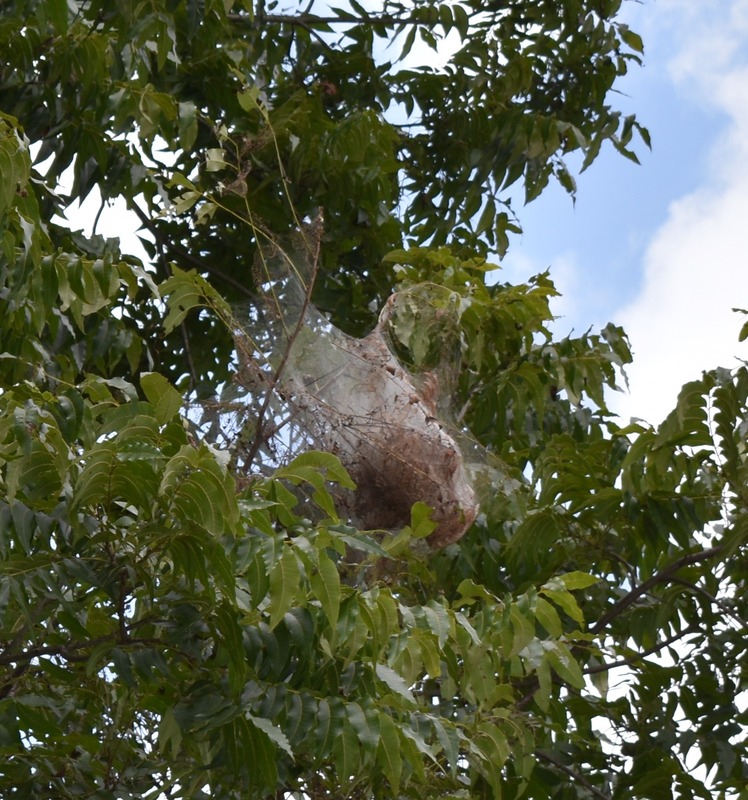 Soon after emergence, the larvae begin creating silk webs to protect themselves as they voraciously feed on their various host plants, of which Pecan is most common in Northwest Florida gardens. Although they are capable of defoliating complete trees, especially smaller ones, most seasons they are kept in check by beneficial insects such as the paper wasp. It is beneficial for small orchards or home growers to scout their trees from June through August. If small webs are observed in young trees, it is best to prune them out with a pole saw or pole pruner and dispose of the branch. 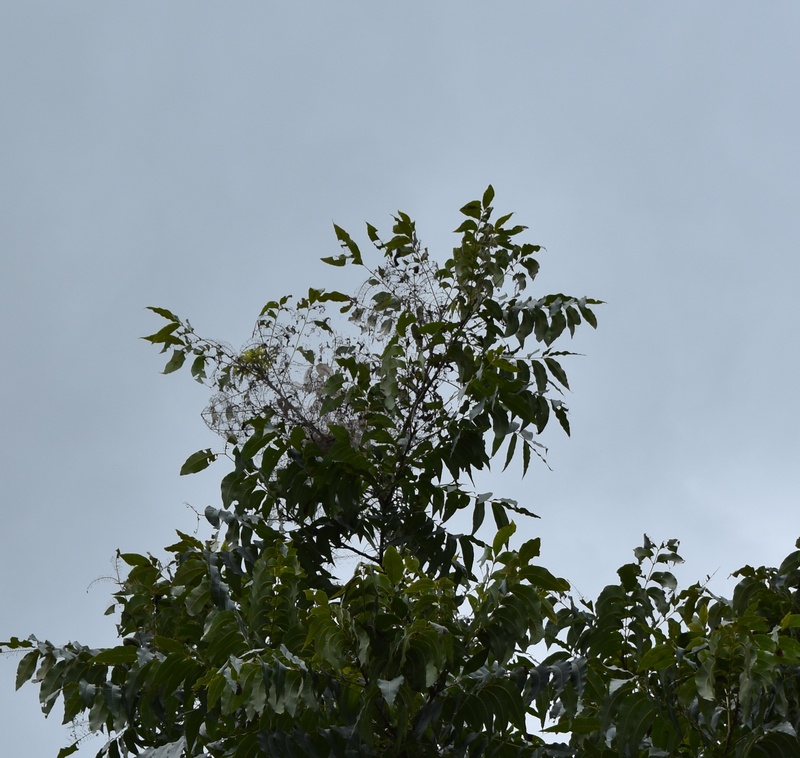 Pruning of small branches does not harm the tree, but it may be of no benefit to remove small webs in larger trees, if they are being controlled by natural enemies. Most home gardens don’t have a practical ability to spray for this insect. For homeowners it is difficult to spray for control, due to the cost of the equipment required to get the spray into the tree canopy. If spraying is an option, many insecticides containing spinosad or Bacillus thuringiensis (Bt) exist. Both of these products target caterpillars while not harming beneficial insect predators that feed on these worm populations. Several more toxic insecticide products exist that will control fall webworm, but they often exacerbate insect problems by killing off beneficial insects that might be controlling other insect pests. Fall webworm is not usually a serious problem for home gardens. Let natural enemies take care of the problem in most cases. Learn more about the fall webworm’s life cycle at the UF/IFAS Entomology Department’s Featured Creature website.